UmaPET ERO/ERI is a polyester based carrier web material treated with migration free silicon release system on one side which provide release effect against a wide range of adhesives. The product has an excellent high speed release, heat resistant, good die cut and ideal anchorage of silicon to film. The film is available in 12-50microns (48 – 200gauge). Release Force (Silicon Coated Side -Using TESA 7475): Low to Medium (Release force can be adjusted according to our customer’s requirement) Applications: Label stock, tapes, shingles etc. UmaPET EDW10A is a Twistable White polyester film with anti-static coating on one side of the film for smooth run ability on high speed packaging machines. The film has excellent deforming properties with superior fold retention, along with good thermal, mechanical and surface properties. The film is available in 15mic (60ga), 18mic (72ga) and 22mic (88ga). UmaPET EDW10A grade complies with US FDA, EC and REACH regulations for food contact applications. UmaPET WHCO is one side Corona treated white opaque film. The film can be used in printing application to eliminate the usage of expensive white ink. The film exhibits excellent adhesion of inks and adhesives. UmaPET WHCO grade complies with US FDA, EC and REACH regulations for food contact applications. 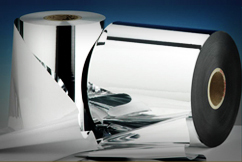 UmaPET WHCIM is a white opaque metallized film with excellent barrier properties. Metallization gives additional benefit of milky white appearance with good gloss on the back side of the film. The film is available in 23mic to 50mic. UmaPET WHCIM grade complies with US FDA, EC and REACH regulations for food contact applications. The film is an excellent combination of performance with aesthetics, gives premium matte appearance with excellent barrier properties. This film is medium haze, medium gloss film used to provide excellent Oxygen barrier (<4 cc/m2/day or, <0.26 cc/100in2/day) in flexible packaging, pouches and lidding applications. The film is available in 12mic (48ga) only. This film could be used in laminates for meat and cheese packaging where storage conditions require below 10 degree C.
The film complies with US FDA, EC and REACH regulations for food contact applications. UmaPET TF-201 is a balance shrinkage film in both MD and TD directions. The film is suitable for extrusion coating for thermal lamination process and provides excellent flatness. It complies with US FDA, EC and REACH regulations for food contact applications.